I was hard on my kids the other day, but they were being very difficult. The reason it bothered me so much was not just that they were being bratty, but because I think they are really wonderful kids. It is out of character for them to be so whiny, so full of attitude. We went to JT's baseball game as a family last night. Tim was coaching, Peyton was helping out as a first base coach. Lucy and Wade were playing together and cheering for their brother. I just took it all in and relaxed. They may have their bratty, normal over the top tween attitudes sometimes, but they are good kids. We are a happy family. This past week has been full of reflection--I've gone back in time remembering what I wanted at 17. I wanted freedom from a mother who ruled my world with negativity and emotional cruelty. I wanted a life full of love and people that not only accepted the fun, happy me, but also the dark and twisty me. What I got was so beyond what I could dream up at 17. I got a husband who makes me laugh, supports me and gives me the freedom to be myself. I got a family full of precious little babes who are becoming more interesting every day. I will write 15,675 more posts about how my children are pouting and driving me crazy, but that's okay. That's normal, life isn't perfect. Right now, I feel lucky and like life is pretty f#&@ing great, and that I know for sure. High school reunions are worth attending, even if you get drunk and can't remember the updates on all those people you haven't seen in 20 years. Did you see my tips on how to have a great high school reunion? Here's the latest MomPulse video. All the cool kids are on Twitter, come play with me. I'm trying to get 1,000 followers by Christmas. Why? Um, why not? Okay, no really here's the deal...I am trying to make some money on my blog by writing sponsored posts and getting advertisers. I would also like to get more opportunities as a freelancer writer and videographer. The more followers I have on Twitter and the more people that like my Facebook page makes me a hotter commodity. And I would LOVE to be a hot commodity. And I would LOVE your help in making me legit. So like me, follow me and share me. I promise to continue making entertaining mistakes in life to keep it interesting, um like getting drunk at my 20th high school year reunion. Click here to follow me on Twitter-@AngelaYBlood. Click here to like the Facebook page. Being hungover at 38 is way sadder than at 18. Am I the only one that thinks the U.S. men's soccer team's uniforms are ridiculous? Look, I'm really happy the team beat Mexico in Mexico for the first time in 75 years. 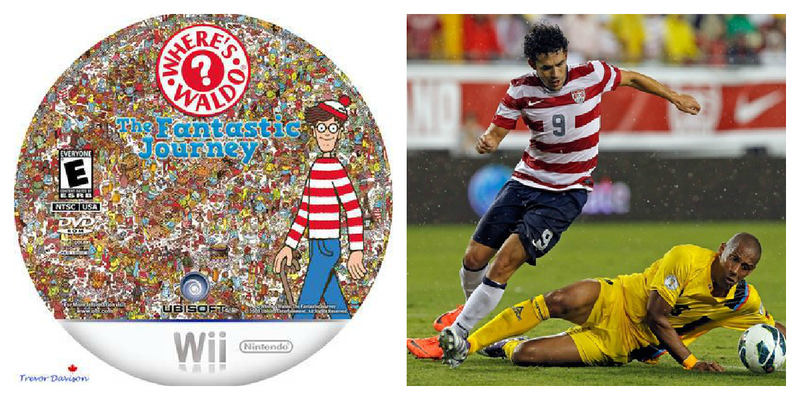 But all I could see in the replays was a group of Waldos from the Where's Waldo children's books series. Anyone else? Potty training is gross. You'd think I would be better at this, since it is my fourth go round, but nope. And I don't care how many times you do it, it will always be gross. One of the best songs of the summer is Of Monsters and Men's Little Talks. 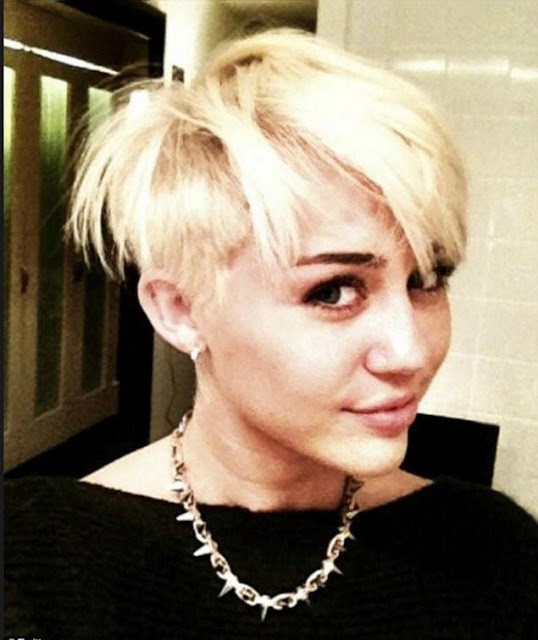 Miley Cyrus looks good. I like her new hair cut. I do. The end. I don't mind sell outs. Indie artists the Avett Brothers (I have been obsessed with them for a year and a half) are in this new Gap ad. People are mad, but I'm happy for them and like Gap more now. The Parent Rap. This is cute. I love the mom- she makes it rain with coupons. Okay, I know a lot this week. But it's really a lot of nothing. What do you know this week? Please share, leave a comment and let me know what you know for sure (this week). Oh I love it! I just need to figure out Twitter - I can't believe I admitted that. I truly look forward to your comments. You and I are so much alike. THANK YOU for reading and commenting and supporting!! owed by so many to so few.